Medium - €47.99 Only 1 left! Large - €47.99 Only 2 left! Every time a bell rings a vampire gets her wings. Wait? That doesn't seem right. Is that how that saying goes? Hmm, oh well. What we mean to say is, when we first saw Mavis spread her delightfully batty wings, it was an exciting affair! How cool would it be to dive off the walls of an ancient tower on a casual Friday evening? While most people don't think the bat lifestyle is overly elegant, they probably haven't acquainted themselves with the ins and outs of the Dracula family. In fact, their stone castle with its Gothic detail and mysterious passageways could totally earn a place in Better Home, Garden, and Masouleum Magazine. With her background, Mavis has got batty chic down to an art. With a consistently black and red wardrobe any up and coming young vampire would love to rock her look! You'll look ready for a Transylvania Hotel evening when you slip into this fashionably gothic attire. The dress is mod, featuring a high neckline, cap sleeves, a simple shift cut, and topped off with the Hotel's badge so people won't think you're a casual visitor, passing through. 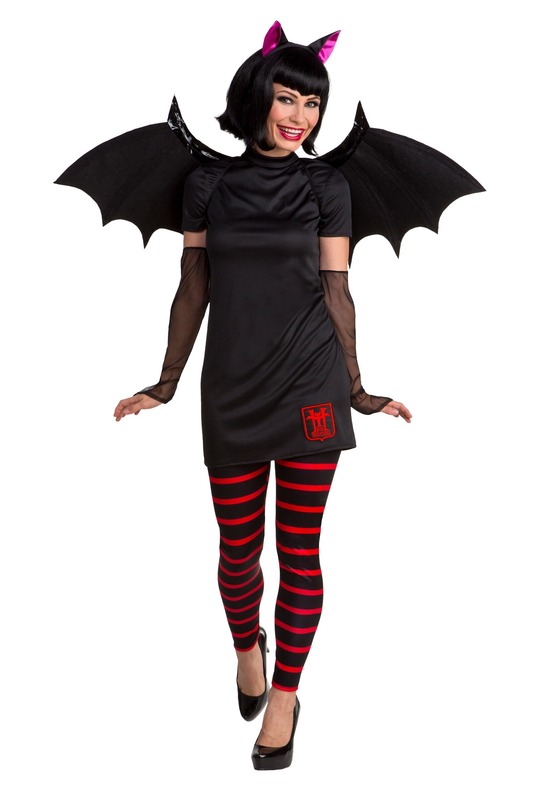 You'll have plenty of attitude with the fishnet fingerless gloves and the whole ensemble looks truly wicked when pieced with bat ears and wings! So step right up and check in to Hotel Transylvania. You're sure to meet some interesting people. Well, maybe not people but you're sure to meet plenty of interesting characters. There's Frankesteins Monster (please don't call him Frankenstein), Mister and Missus Big Bald Wolf, and Peter the Poltergeist. Pair up with the red-haired Johnny to make this a romantic partner Halloween costume. Hey, if your really want to make it a party you could bring Dracula himself around. Once people check into this hotel, you just won't want to check out!